In my last post I talked about how to convert the koch snowflake fractal into an iterative distance estimator. That can provide some interesting results for a simple 2d fractal, but now let’s ramp this up into three dimensions and introduce Kaleidoscopic IFS fractals! First off, a big bit of recognition to Knighty who came up with this approach on fractalforums a few years back (link in the footer!). To start with we’re going to derive an approximate distance estimator for the sierpinski pyramid. The sierpinski pyramid is easiest to describe as a 2d shape before extending into 3 dimensions. Take a piece of paper and draw an equilateral triangle. Now mark the midpoint of each edge and connect the midpoints to form another equialateral triangle. This centre triangle is the hole. Now for each of the three triangles on the edge, mark the midpoints and draw an equilaterial triangle. Again the middle is the hole, and you can iterate to each of the edge triangles. In three dimensions we do this same operation using a tetrahedron as the basic primitive instead, sneak a peak below if you want to know what this looks like! Now we need to iterate the fractal by replacing each of the spheres with another instance of the pattern. To do this we scale by 2, and subtract the unit vector to move the shape back into the location of the original sphere above, remembering to divide the distance returned by 2. Now we can iterate the folds again before the scale, and hey presto, iteration 2 of the sierpinski pyramid. And it’s also possible to easily ramp up to 15 iterations of the pyramid without C&P’ing enormous numbers of times, and now you’ll understand why we don’t need to worry about the basic primitive of our fractal being a sphere! This basic form of the shader above doesn’t use any of the fun tweaks which were originally suggested by Knighty. First up we have the first two vectors. These are rotations which are used before or after the folding. They give slightly different effects, the following two images show pre-rotations. The third unit vector is the vector that is used to offset each iteration, tweaking here can give some nice effects. The final number is the scale factor, and again you can create some interesting variants using these values. Next up we need to think about how to colour these IFS fractals. Using a plain colour shows the detail of the shape nicely, but it’s a bit boring to look at, particularly if you’ve seen some of the fancier renders that people have produced using other fractal software. The key to colouring an object is to come up with a value which is in the range 0->1. Once we have that value we can use it to index into a colour ramp and produce some pretty renders. With a kaleidoscopic IFS fractal there is no possibility of using something like an iteration count because all elements of the object will have been iterated the same amount. Instead we can use the number of folds that were used to get to each point of the fractal. Note that we have 3 folds for the tetrahedron. We would expect the average random point in space to be either side of the fold 50% of the time as it seperates space into two equal halves. Now we can turn the lights back on and start to have a bit more fun with our colouring! And with that I’m going to wrap up! 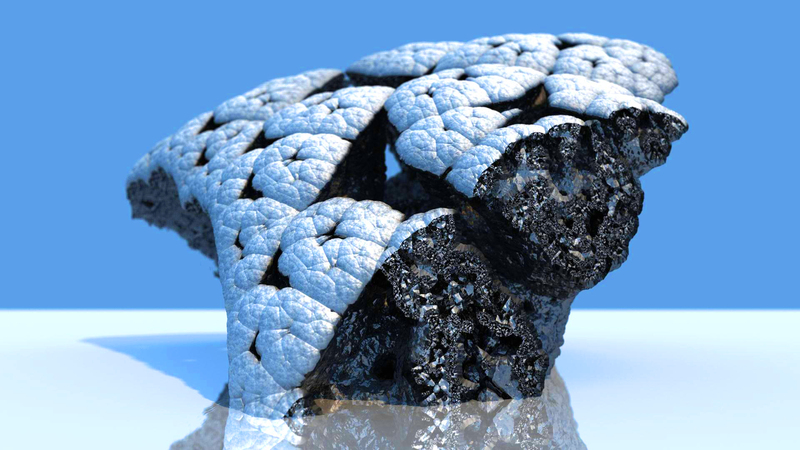 For more information about KIFS fractals (and more inspiration) check out the original thread on fractal forums. For updates and all the latest news on my own progress, and the progress of wooscripter, follow my twitter feed at @dom767. The next step will coloring orbit Trap? Glad you like it! I don’t think orbit traps work with IFS functions, but I will be doing orbit trap colouring for the mandelbox and mandelbulb. Next on the list! Your render looks great btw, particularly with the slice through the fractal, although if you want to remove the slice then set distanceextents=vec(2,2,2). orbitTrap for IFS fractals works great for fragmentarium, inherent in most raytracer, why not work? Interesting. I clearly need to do a bit more reading on orbit traps then! My understanding was that orbit traps were used to evaluate fractals which “escape” a certain orbit (i.e. mandel**** fractals, julia sets, etc..). I’ll look into how this works.